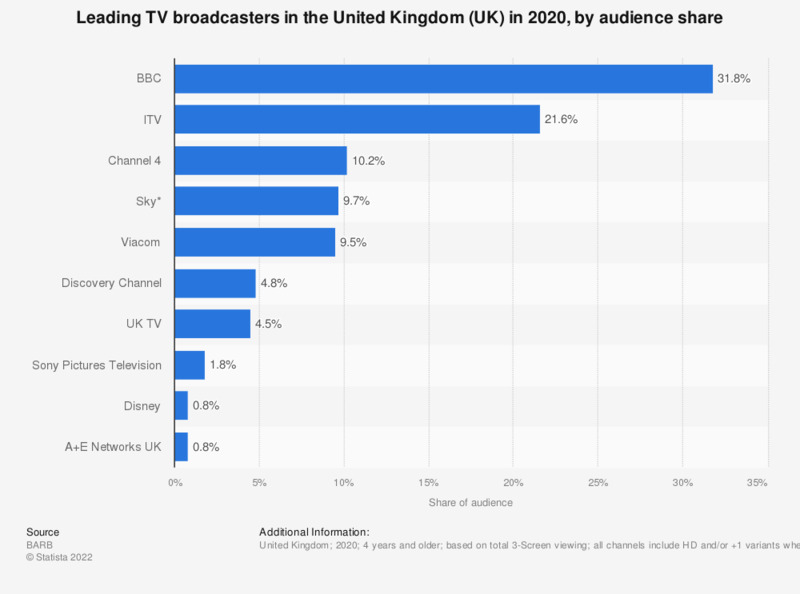 This statistic displays a ranking of TV broadcasters in the United Kingdom (UK) in 2017, by share of TV audience. BBC held the largest audience share, with 31.57 percent of total viewing. For the fiscal year 2016, the public service broadcaster stated an annual income totaling 4.96 billion British pounds, of which 3.79 billion came from license fee income. As of quarter four 2017, BBC's flagship channel BBC 1 was the leading TV channel in the UK in terms of reach, while BBC News was the leading television news channel. Broadcasters ITV and Channel 4 had the second and third highest audience share in the UK in the period of consideration, with 21.71 percent and 10.23 percent, respectively. * The source defined audience share as: "annual percentage share of total viewing." The broadcasters listed all own four or more BARB reported channels. For additional information regarding methodology, see here.